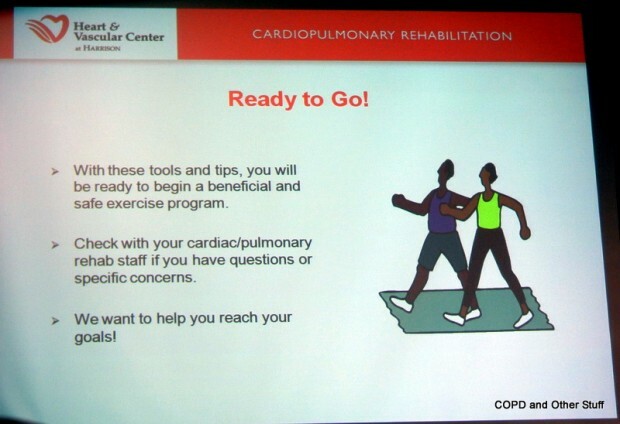 YES, COPDers CAN improve aerobic capacity with one-legged exercise training compared with two-legged training in stable patients with COPD. However – how practical is it for the COPDer riding out in traffic for fun and exercise perched upon one of those crotch-numbing seats on an upright bicycle with one pedal? Studies are great and as a COPDer, some studies are cause for great excitement learning how we can add more to our daily lives to help ourselves. 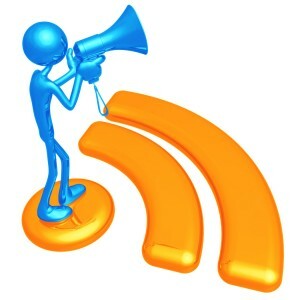 The big question here is – how do the study results transfer over to using it in a practical way? Thanks to Chris Wigley a COPD friend and fellow EFFORTS member in Canada for the following study. 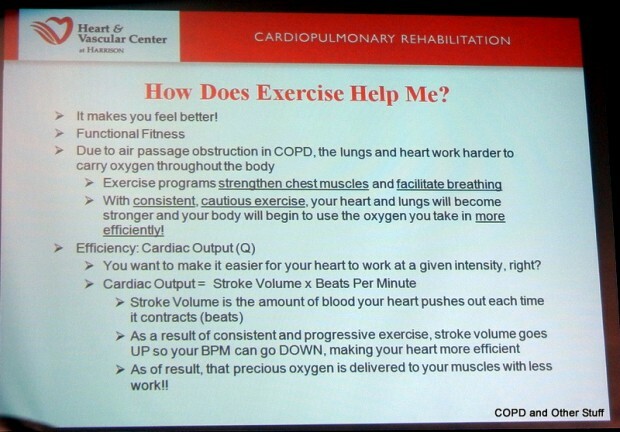 Published in Chest – results on one-legged exercise training. Additionally, how do water workouts help the COPDer gain FEV1 if they are strenuous air exchanges? My swim coach, Marilyn Grindrod cranked up our workouts yesterday and I feel it for the first time – excited and pleased to feel muscles I have not felt in years and my endurance has increased…far fewer slowdowns to breathe. 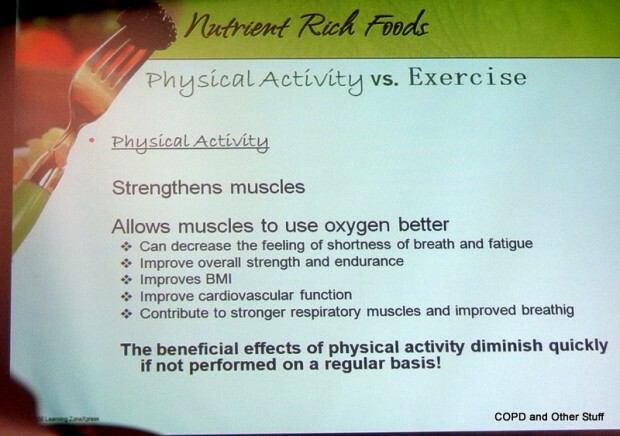 It seems to me that oxygen must be moving more getting to the rest of the body. The water workouts will build up the muscling around my left hip so – hopefully – I can get back on my regular recumbent trikes. Currently we are working harder on my upper body conditioning and muscle building for my arm pedal recumbent trike. One way or another, I have a cycling trip to take. I would like to know why these bike studies use the upright bike when – for most COPDers, we are better off on the more stable and comfortable recumbent trikes – many due to mobility issues. Most seniors can ride a recumbent trike – fewer can ride the crotch killing upright bike. *From Respiratory Diagnostic and Evaluation Services (Mr. Dolmage), West Park Healthcare Centre Toronto; and Department of Medicine (Dr. Goldstein), University of Toronto, Toronto, ON, Canada. 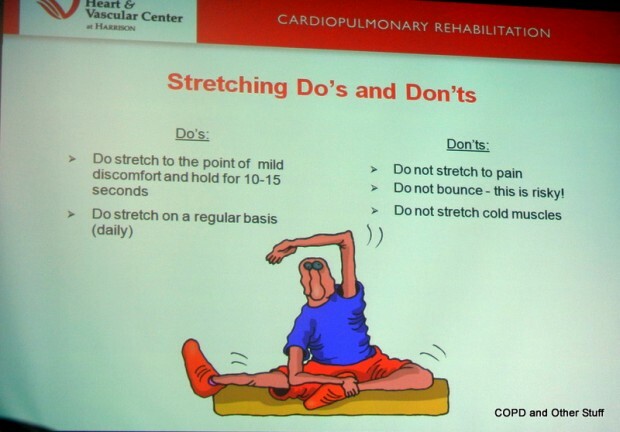 Background: Most patients with severe COPD are limited by dyspnea and are obliged to exercise at low intensity. 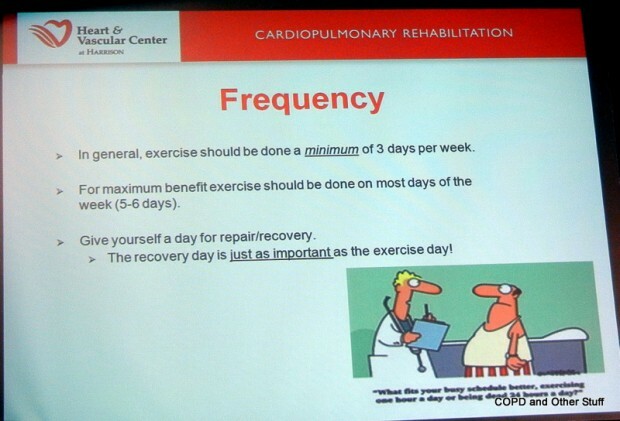 Even those undergoing training do not usually have increased peak oxygen uptake (V̇o2). One-legged exercise, at half the load of two-legged exercise, places the same metabolic demands on the targeted muscles but reduces the ventilatory load, enabling patients to increase work capacity. The purpose of this study was to determine whether one-legged exercise training would improve aerobic capacity compared with two-legged training in stable patients with COPD. Methods: Eighteen patients with COPD (mean FEV1, 38 ± 17% of predicted [± SD]) were randomized to two groups after completing an incremental exercise test. Both trained on a stationary cycle for 30 min, 3 d/wk, for 7 weeks. Two-legged trainers (n = 9) cycled continuously for 30 min, whereas one-legged trainers (n = 9) switched legs after 15 min. Intensity was set at the highest tolerated and increased with training. Results: Both groups increased their training intensity (p < 0.001) and total work (p < 0.001). After training, the change in peak V̇o2 of the one-legged group (0.189 L/min; confidence interval [CI], 0.089 to 0.290 L/min; p < 0.001) was greater than that of the two-legged group (0.006 L/min; CI, − 0.095 to 0.106 L/min; p = 0.91). This was accompanied by greater peak ventilation (4.4 L/min; CI, 1.8 to 7.1 L/min; p < 0.01) and lower submaximal heart rate (p < 0.05) and ventilation (p < 0.05) in the one-legged trained group. Conclusion: Reducing the total metabolic demand by using one-legged training improved aerobic capacity compared with conventional two-legged training in patients with stable COPD. 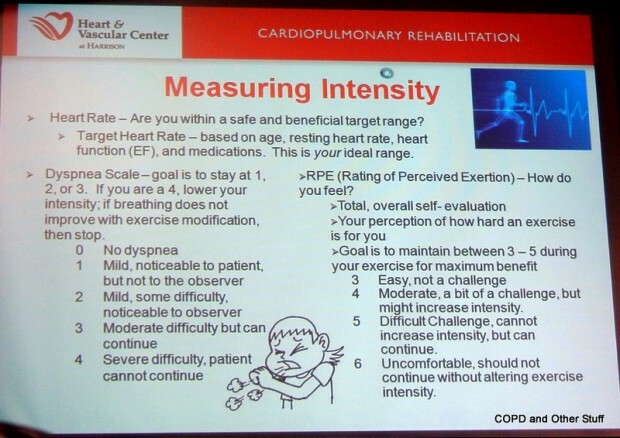 The cornerstone of pulmonary rehabilitation is exercise training, based on the premise that altering physiologic processes will result in improved outcomes.12 Intensity and duration are important determinants of the physiologic adaptations that occur in response to exercise training.3456 However, most patients with COPD are so limited by dyspnea, even at modest levels of ventilation, that their training is restricted to low-intensity exercise.7 As a result, when undergoing exercise training they are usually unable to increase their peak oxygen uptake (V̇o2),8 although this measure is the recognized standard for confirming the physiologic effects of aerobic exercise training. One approach that might allow training at a higher intensity, addressing the peripheral muscle deconditioning, is to partition the exercise to a smaller muscle mass while maintaining the same muscle-specific load. We have reported that patients with COPD achieved more work when cycling with one leg.9 Despite the same load being applied to the muscle, one-legged exercise placed the same metabolic and functional demands on the targeted muscle, at a lower total metabolic load, and hence a lower ventilatory load. The next logical step is to test the hypothesis that training using a one-legged technique, thereby increasing the muscle-specific stimulus, would induce physiologic changes sufficient to increase peak V̇o2. We report the influence of one-legged training on peak V̇o2 during incremental exercise compared with conventional two-legged training under identical conditions of training frequency and session duration. 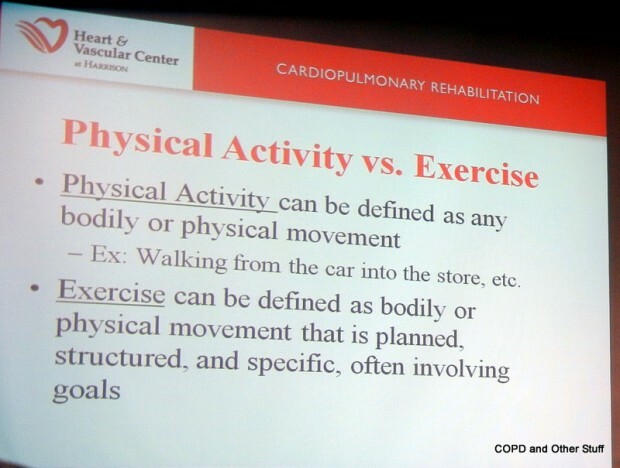 Inclusion required a diagnosis of COPD10 based on standardized spirometry,11 clinical stability, smoking abstinence, and willingness to enroll in an inpatient or outpatient pulmonary rehabilitation program that included supervised exercise, education, and psychosocial support. 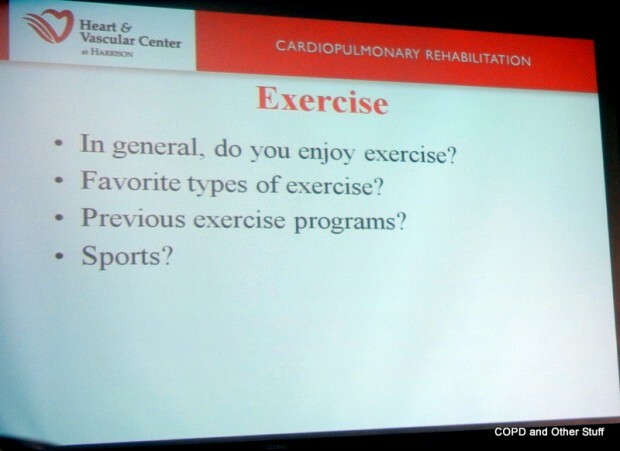 Patients were excluded if they were hypoxemic at rest (Pao2 < 55 mm Hg), had comorbidities that limited their exercise tolerance, or were unable to provide informed consent. After baseline assessments, patients were allocated to one of the two exercise training methods (one-legged or two-legged training) according to an unrestricted computer-generated randomization list. The study was approved by the West Park Healthcare Centre Research Ethics Committee. Both the one-legged and the two-legged groups followed the same training regimen, except that one-legged trainers used the first half of the session to train one leg, followed immediately by completing the session using the other leg. Patients allocated to the one-legged group cycled while resting their inactive foot on a crossbar located midway on the ergometer head tube (Fig 1 ). Two-legged trainers cycled continuously throughout the session. Training was performed on an electromechanically braked cycle (Collins CPX Bike model 0070; Warren E. Collins; Braintree, MA) while breathing room air. Supervised training sessions were scheduled for three times per week for 7 weeks. 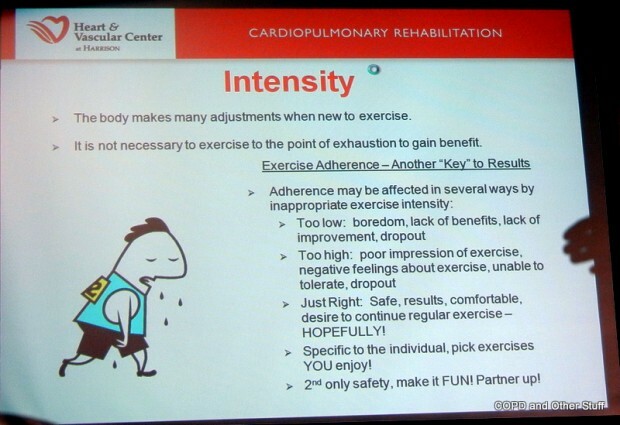 The intensity was intended to allow 30 min of continuous exercise excluding warm-up and cool-down periods. 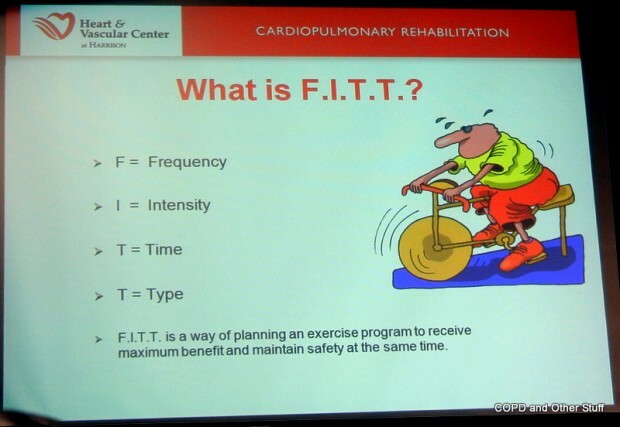 The intensity was set at 50% and 70% of the peak power (Ppk) attained on the baseline incremental test for the one-legged and two-legged trainers, respectively, and reduced as necessary to obtain at least 30 min of continuous cycling; therefore, during the first week of the program, patients trained at a mean of 40% Ppk for one-legged and 56% Ppk for two-legged training, respectively. 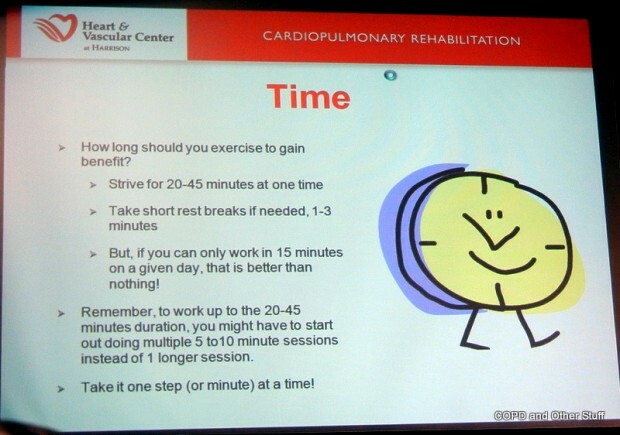 When the exercise duration reached 30 min for three consecutive sessions the training workload was increased by 5 W. The goal was to train at the highest power that the patient could maintain for at least 20 min. If, at any time, the patient found the workload intolerable, it was reduced to its previous setting. 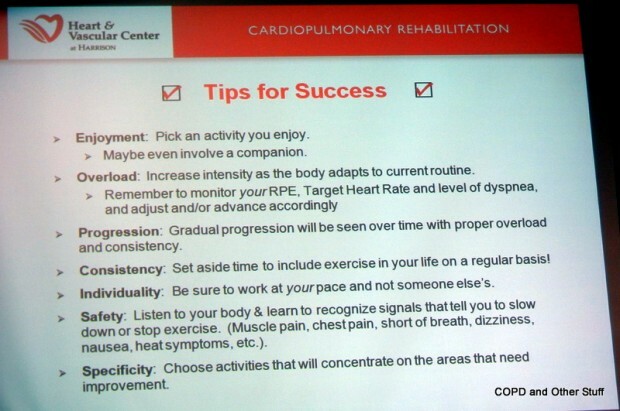 All other rehabilitation modalities were similar. One-legged cycling. The subject is shown (having given informed consent) pedaling with his right leg while resting his left leg on the crossbar, midway on the head tube. … The load was set at 80% of the Ppk achieved on the baseline incremental test. Patients breathed ambient air during all tests. Eighteen patients, 9 randomly allocated to each group, completed the study. Two patients withdrew: one allocated to the one-legged group, following an acute exacerbation; and the other patient, allocated to the two-legged group, was uncomfortable cycling. The baseline characteristics of each group are presented in Table 1 ; there were no significant differences between study groups. All of the nine patients allocated to the one-legged group could easily manage this technique after simple instruction from the trainer. Both groups significantly increased their training intensity (p < 0.001) over the duration of the training program (Fig 2 ), with no significant difference between groups in the progression of training intensity. Three of the nine subjects in the two-legged group progressed to a training intensity of > 80% Ppk; one of the nine subjects in the one-legged group progressed to a training intensity of 86% Ppk. Both groups significantly increased their total work per session (p < 0.001) over the duration of the program (Fig 3 ). The slope of absolute work vs training time was greater in the one-legged group than in the two-legged group (p < 0.05). Models suggest that a limitation in the exercising muscle contributes to the low peak V̇o2 in COPD patients.3031 In our study, peak V̇o2 during incremental exercise increased among the one-legged training group, and V̇e at submaximal exercise decreased.71932 Some of the observed differences between groups, such as the lower submaximal HR and the increased posttraining peak V̇e in the one-legged group, were unexpected. Although the effect of one-legged cycling on constant power endurance time was large, it also increased in the two-legged trainers, which almost certainly prevented there being a significant between-group difference. Had one-legged cycling been compared to a control group who did not exercise, there would undoubtedly have been statistically significant differences in constant power endurance. The latter measure is quite variable36 and therefore requires a larger sample size than was included in this study. To minimize any small bias that might be associated with the absence of blinding,8 we used standardized instruction and encouragement during the exercise tests and included a comparison group of two-legged trainers, who expected to experience a positive training effect. The changes in effort independent submaximal responses, such as HR, also supported the differences being attributable to a treatment effect. 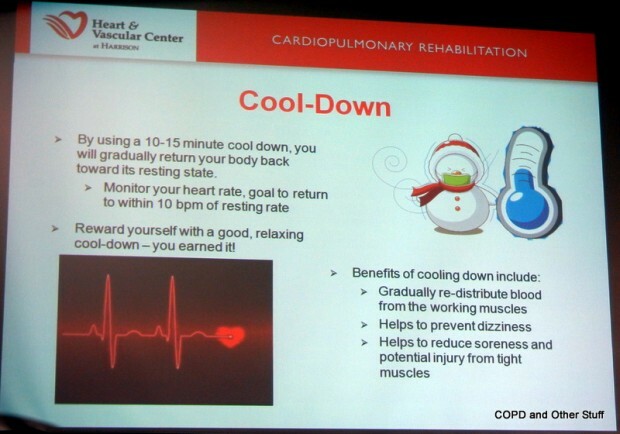 Within the spectrum of COPD patients, this training modality may be most effective among the more severely ventilatory-limited patients. 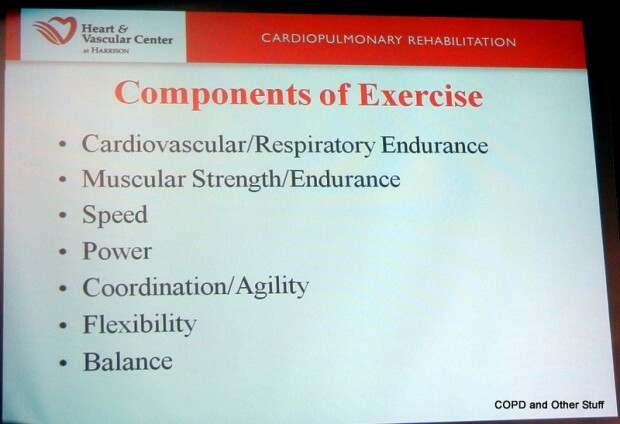 In summary, we report the effects of one-legged cycle training on aerobic capacity in patients with COPD. Compared with conventional two-legged cycling, there is evidence that one-legged training enhances the adaptive response of peripheral muscle, resulting in increased peak V̇o2, Ppk, and peak V̇e. A large prospective clinical trial will better characterize the ideal candidate and provide a sample size sufficient for this method of training to be assessed using more variable outcomes such as constant power exercise and health-related quality of life. 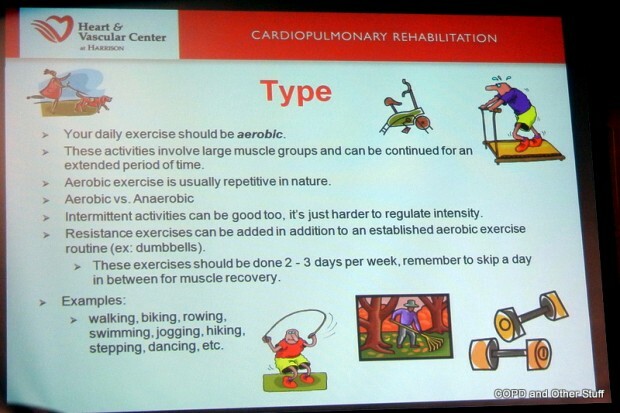 Muscle-specific training should be considered in conjunction with other approaches that improve exercise capacity in patients with chronic respiratory conditions. The authors thank the patients of West Park Healthcare Center as well as Mika Nonoyama and Stefania Costi for help supervising the training sessions. I wrote the following about 2004 for the American Lung Association and re-found it goggling for COPD. I’m posting it here in hope you will see the value in early detection Spirometry testing. “Living with COPD/Emphysema and Sarcoidosis was a living death. I existed. 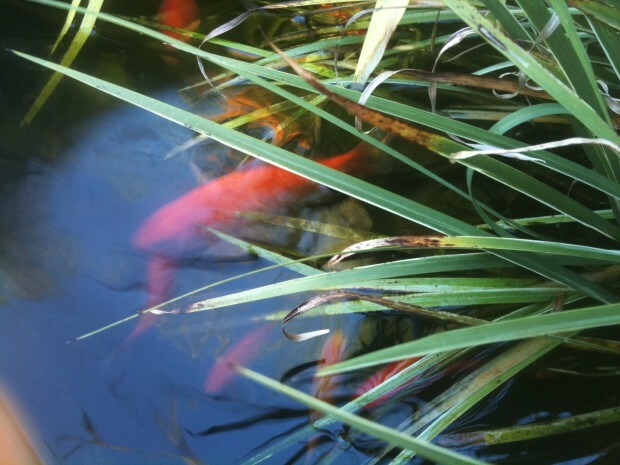 I struggled to breathe, when I moved I panted, gasped for air like a fish out of water. As I slowly showered and dressed, ready to go somewhere, I couldn’t sit down to rest. I fell asleep. I went from a physically active life landscaping, restoring a wonderful property in Port Townsend to a blob who existed in front of her computer. I searched the world web to discover what COPD/Emphysema was – what Sarcoidosis was, everything, anything I could find out about my diseases and the medications I took. I couldn’t sleep in a bed – I couldn’t breathe – I dozed sitting in a chair. By the time I arrived at the Pulmonary Department at the University of Washington Medical Center, I believed my days were numbered. Previously diagnosed with COPD/Emphysema, an open lung biopsy showed the fibrosis and granulomas of Sarcoidosis evenly throughout both lungs. Without energy, I felt isolated, without a purpose, a shell, a mockery of the person I used to be. I regretted a 40-year smoking habit, but didn’t dwell on it. The single most difficult thing I’ve ever done is stop smoking. I craved cigarettes and for the first time understood a drug addict’s ‘craving’ for a drug. I craved a cigarette many times a day, then almost daily for more than two years. Even today, occasionally the urge to smoke a cigarette becomes almost overwhelming. That is how I felt then. Today I’m energized with purpose. I found a support group online – the non-profit EFFORTS, begun by COPD’rs, run by COPD’rs and filled with folks like me working to change the world’s awareness of COPD. I want other lung folks to know they are not alone and how they can lead the best quality of life possible. 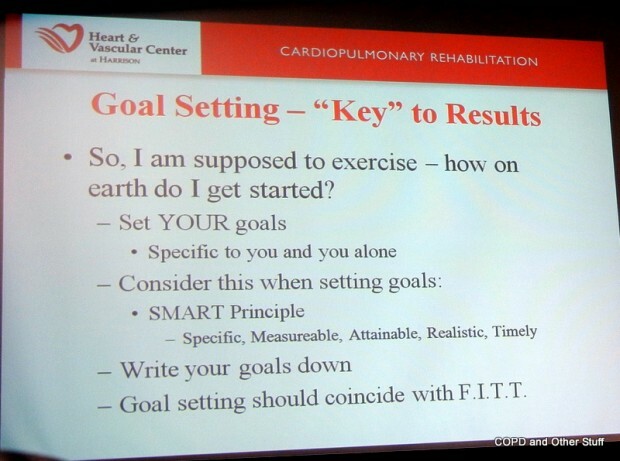 I want to see Spirometry tests for patients. common place among physicians – to catch COPD early – before it is too late. Other than stop smoking, the single most important thing Lungers can do for themselves is exercise.